When learning how to play jazz guitar, one of the concepts that comes up time and time again is the tritone substitution. Tritone substitution is a common chord substitution for dominant chords and occurs often in jazz standards. The tritone concept is also very useful for comping and improvised solos. In this lesson, you’ll be looking at a simple way to think about the tritone substitution, as well as explore a few examples of how you can apply this cool concept to your jazz guitar comping and solos. What is a Tritone Interval? What is Tritone Side Stepping? One of the first theory terms you hear, and one that comes up time and again when studying jazz guitar, is the tritone. In classical music, the tritone is known as diabolus in musica (the Devil in music) or the devil’s interval. There are different applications of the tritone, including guide tones and tritone subs, but before you dive into those concepts, you need to know exactly what a tritone is. In this section, you learn what a tritone is, how it sounds, and how to apply it on the guitar. A tritone is the interval between a root note and 3 tones above or below that note. If you want to know what a tritone sounds like, it’s the opening notes to the Simpsons theme song. “The Simps” is a tritone, then it resolves to the perfect 5th on “ons”. F-B is a tritone interval: F to G is 1 tone, F to A is 2 tones, and F to B is 3 tones. The last bar in the example below shows you how to play a tritone interval without stretching your fingers beyond 1 fret on the low 2 strings. Try playing the last two notes in this example and sing “The Simps”, then play the 3rd fret C on the 5th string and sing “ons”. You’ll hear it right away. Now that you know what a tritone is, let’s look at how we use it in your jazz guitar playing, specifically over dominant 7 chords. If you look at any dominant 7 chord, you find a tritone interval built into that chord shape, between the 3 and b7 of the chord. Below you’ll see the D7 example in tabs. The first two bars are a D7 chord solid and broken so you can see the full shape. The last two bars are the same shapes with the root and 5th removed, leaving only the 3 and b7. The 3 and 7 of any chord are called guide tones because even if you only play those two notes of a chord you can hear the chord progression. The 3 tells you if the chord is major or minor based. The 7 tells you if the chord is maj7, m7, or dominant 7. Play these shapes on the guitar to get a feel for how they sit on the fretboard and how they sound. With the knowledge of how tritones create the 3rd and 7th intervals of any dominant 7 chord, you can now take that to the fretboard. Here’s the tritone (3 and b7) for D7 in four positions on the guitar. Play each one to hear how they sound and get an idea for how to finger tritone intervals on the fretboard. After you play through these 3rds and 7ths, move on to the next section where you apply those shapes to a 12-bar blues in D progression. Now that you know what a tritone is and how it fits into dominant 7 chords, you can take that knowledge to a playing situation. Here’s a 12-bar chord study over a blues in D that uses only the 3rd and 7th of each chord. For each dominant 7 chord, the interval between the 3 and b7 is a tritone interval. For Em7 that rule doesn’t apply, though the 3rd and 7th still sound good over that chord. Work out this comping study, and then when you have it down add this concept to your comping over other blues and standard chord progressions. You can also use tritone intervals in your single-notes solos, both to outline the 3rd and 7th of any chord, as well as the transitions between chord changes. Here’s an example of a solo that focuses on both approaches. You see the 3 and b7 (a tritone) played over specific dominant 7 chords. You also see the 3 of one chord move by half step to the b7 of the next chord, creating a smooth movement between chords along the way. This is called voice leading. Work on this solo in your studies. Then when you’re ready, add this concept of 3rds and 7ths to your own solos over blues and other progressions. The tritone substitution is one of the most commonly used chord substitutions in jazz. Tritone substitution is fairly straightforward to understand, but learning how to add these cool-sounding chords to your comping ideas can be tougher than it sounds. In this lesson, you will learn why tritone subs function as they do and how to apply them to various chord progressions. To begin, let’s look into what a tritone sub is and how you can apply it to any dominant 7 chord you are comping over. A tritone substitution is taking any dominant 7 chord you see and play another dominant 7 chord that occurs a tritone (#4 aka b5) away from that initial chord. For example: playing Db7 over G7. The reason that this substitution works is that dominant 7 chords with a bass note a tritone apart share the same 3rd and 7th. This is the glue that holds the two tritone sub chords together. Now that you know how tritone subs function and how to apply them to dominant 7th chords, let’s take a look at some common applications. The first practical application of tritone substitutions we will look at is in the fourth bar of a jazz blues chord progression. When playing on a common blues progression, you normally play I7-IV7-I7-I7 in the first four bars of the tune. You can apply a tritone substitution in bar four. In the key of F, this is a B7 chord, which resolves down by a half step to the IV7 chord (Bb7 in this key) in bar five. Here is how that substitution sounds over a jazz blues chord progression in F.
To help you get started with this tritone blues substitution, here is an example of how you can play through this pattern. Probably the most popular choice for a tritone substitution is over the V7 chord in a major key ii-V-I progression. To help you get started with this tritone ii-V-I progression, here is an example of how you can play through this pattern in the key of C major. Once you have these examples under your fingers, try applying them to tunes which contain a number of ii-V-I progressions, such as Tune Up or All The Things You Are. Another popular progression that you can use to practice and apply tritone substitutions is the turnaround, which usually occurs at the end of a tune or section. The standard major key turnaround uses the chords I-VI-ii-V, as you can see in the top changes of the example below. The first place to apply a tritone sub is the V7 chord, as you can see in the chord changes in the lower staff. When replacing the V7 chord with a tritone sub, you are creating the chord progression I-VI-ii-bII. To help you get started with this tritone turnaround, here is an example of how you can play through this pattern in the key of C major. You can also apply a tritone sub to the VI chord in a turnaround, which you can see in the following progression. When replacing the VI7 chord with a tritone sub, you create the chord progression I-bIII-ii-V.
Lastly, you can apply a tritone sub to both the VI and V chords in a turnaround to produce the chord progression I-bIII-ii-bII, which you can see and hear in the next example. To help you get started with this combined tritone turnaround, here is an example of how you can play through this pattern in the key of C major. Learning how to confidently apply tritone subs to your jazz guitar comping phrases is an essential tool for any jazz guitarist to have. Working on it in your daily routine until you can apply it smoothly will help take your comping to the next level of creativity. The scale of choice to solo over tritone substitutions is the Lydian dominant scale. The Lydian dominant scale is a mode of the melodic minor scale. The altered scale is also a mode of the melodic minor scale. These 3 scales are related and contain the same notes, but start on a different root. The Lydian dominant scale is also very similar to the Mixolydian mode, the most common choice to play over dominant chords. The only difference is the #4 of the Lydian dominant scale, which is a natural 4 in the Mixolydian scale. The first lick starts with the D minor bebop scale and goes to the Db Lydian dominant scale in bar 2. The second lick starts with a Dm7 arpeggio, goes into the Db Lydian dominant scale in bar 2, and finishes on the 9 of Cmaj7 in bar 3. Another scale you can play over tritone substitutions is the major pentatonic scale or the major blues scale. The following example starts on the D minor pentatonic scale, goes to the Db major pentatonic scale in bar 2 and ends on the C major pentatonic scale in bar 3. Besides scales, you can also use arpeggios to play over tritone substitutions. This basic lick starts on the Dm7 arpeggio, goes to the Db7 arpeggio in bar 2 and ends on the Cmaj7 arpeggio in bar 3. Learning how to bring a modern jazz guitar sound into your improvised lines, in the style of great players such as Adam Rogers, Kurt Rosenwinkel, Ben Monder and John McLaughlin, can be tough. But, with the right focus, and breaking ideas down into digestible chunks, you can learn to bring a sense of tension and release into your playing just like your favorite modern guitarist. In this section, you’ll be looking at how you can play two chords at once over any underlying chord progression in order to bring a modern feel to your lines and phrases. Though the concept and ideas in this lesson can be applied to any chord or progression, we’ll be exploring it first over a Cm7 chord. While many of us have checked out side stepping where you move between two chords a 1/2 step apart, you can also bring a modern sound into your lines by playing two different chords a tritone apart over the underlying chord(s) of a given progression. For example, if you are soloing over a Cm7 chord, you can move between the chords Cm7 and F#m7 (2 minor 7 shapes a tritone apart). Here are some examples of how you can bring this sound into your practicing and improvising as a jazz guitarist. A good way to outline these two changes is to use arpeggios for each chord. Here is how that would look like on the fretboard, beginning with Cm7, then moving through F#m7 and back to Cm7 again. Here is another lick over a static Cm7 chord, using the tritone side-step arpeggios as the basis for the phrase. Work this lick as written with a metronome in the given key, and then take it across the neck in all 12 keys. When you’ve worked it out and are comfortable with this line, try writing out a few licks of your own using the tritone side-step arpeggios as the basis for those phrases. Writing out lines using a specific concept can be a great way to get a handle on a new idea while bringing new lines and phrases into your vocabulary at the same time. Another pattern you can use with this tritone concept is the 1235 pattern. The 1235 pattern is made famous by John Coltrane, who used it in many of his classic solos including his legendary solo on the tune Giant Steps. This pattern uses the triad of the underlying chord (135) and mixes in the 2nd for good measure. As well as sounding good over chord changes, the 1235 pattern is fairly easy to play on the fretboard. Here is an example of the 1235 pattern for both Cm7 and F#m7 played over a static Cm7 chord. Here is another example of the 1235 pattern used in a tritone side-stepping line over a static Cm7 chord. Here is a sample solo over a C minor blues chord progression that uses this concept to build every m7 line in the solo. 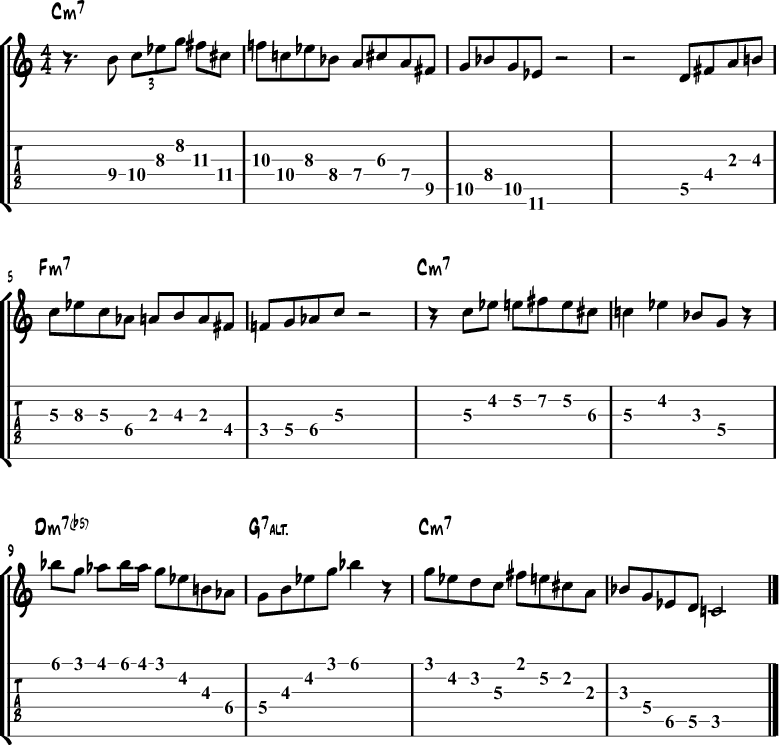 Start by learning this solo as written, then try writing out your own solo etude over a minor jazz blues chord progression in a similar manner. From there, begin to improvise over minor blues chord progressions and use the tritone side stepping concept to bring a modern flavor to your minor 7 lines. Do you have a question or comment about this lesson? Post it in the comments section below. Thanks, you always give precious way indications to decode and develop new materials. Hey you guys! Congrats to all Jazz lovers! I’d like to be an Official Fan HOW DO I SIGN UP ? Thanks, glad you like the site. You can join the Forum here http://www.jazzguitar.be/forum/. 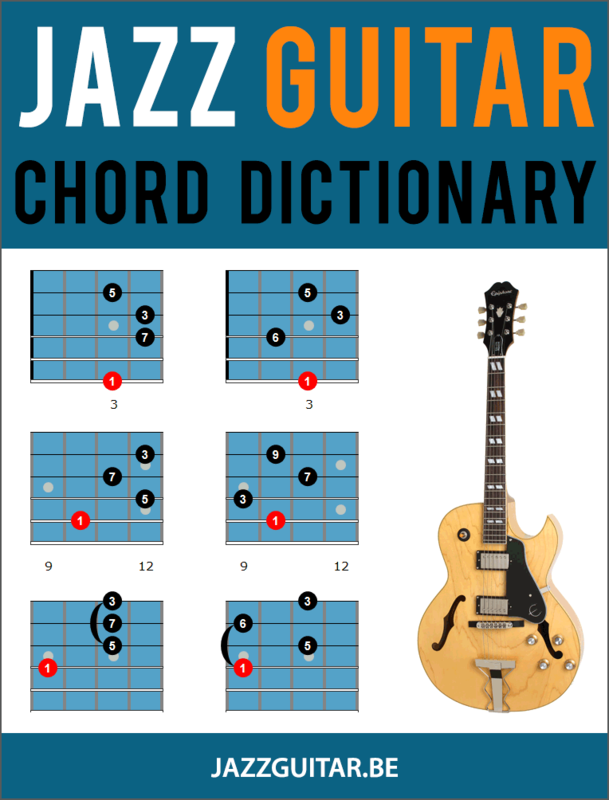 Or you can get a free ebook and join the newsletter here http://www.jazzguitar.be/subscribe.html. Or follow us on Facebook by clicking the box at the bottom of this page. Cheers! Merci pour ces plans et ces explications. On avance grâce à toi. Como siempre ,excelentes articulos,este ,en particular muy interesante,y practico! GRACIAS! You can use F#maj7, but I find it’s easier to keep the same type of chord when playing two at a time. So maybe start there and then move on to other qualities over m7. These are so cool and “out” sounding! Trying to work them in right now with the other stuff we’ve been working on over Summertime and Tune Up to add a little spice! Thanks! That’s correct Erwin. But as we normally see chord changes written as Dm7 and G7 in lead sheets, as opposed to the more detailed Dm9 and G9, we used those in these examples. Hope that helps. Cheers. are we able to substitute any chord where the chord tones are common? does this concept extend into secondary tones and is there a guiding principal for such substitutions? You can expand on this idea with other chord types, like playing Dm7-Abm7 back and forth over Dm7, but then it’s a bit more tricky to control and resolve properly. If you are just getting started I would stick to the 7th chord tritone, like G7-Db7, and when that’s comfortable explore further from there. Great lesson. If we are comping while someone is improvising, would it be wise to use tritone subs. I have an audition coming up, and the standard i chose to improvise over is tune up, do you think it would benefit me any to use tritone subs for a chorus of comping? Thanks, that’s a great tune to apply these subs to. If you can get a few down comfortably then I would try them out, could help out in the audition for sure. Awesome lesson, really gets to the point. Thanks! Thank you very much for your invaluable lessons. I really really learn so much from it. Thanks for your very good pages and resources for learning! I think I have not quite understood this lesson though, or at least the idea of a tritone. In the cases explored above, why are we not just talking about 3rds and 7ths as guide tones, why does it become necessary to think of them as tritones when it comes to Dom7? Thanks for checking out the lesson, it’s because that’s the distance between those two notes. It’s an example of a tritone in jazz. But can you explain the voicings in the 2nd example under “Tritone ii V I Chords”? Not obvious how they relate. Hi Simon! The first chord is an Fmaj7, a common sub for Dm7. The second voicing is a rootless Db9 and the third one a rootless Db13, both tritone subs of G7. The 4th voicing is a C6. The last 2 voicings are quartal chords of Cmaj7. I hope that makes sense! I understand the theory behind tritone/substitution but I fail to grasp the practicality. In the original example above, if I were to assume a G in the root, the Db7 chord substitution -essentially- sounds like a … G7b9#11 chord (?!?). I am definitely treading uncharted territory here, but can I think of the tritone substitution as a less complicated chord notation? On the other hand some people have photographic memory and have not problem memorizing/visualizing and fretting difficult notations. What exactly is going on here. Thanks! Hi Dimi, you’re right. Db7 with G in the root would be G7alt. But, Db in the root makes it a Db7#11, with its own distinctive sound. Thank you, OK, same notes but a (very) different sound depending what’s the lowest note played. So if the guitar goes for the tritone substitution sound in the comping what about other instruments in the band, i.e. bass or piano. Should they follow the chart or listen and reciprocate to what the guitar is doing at the time. And in the first case how a Db7#11 with a G in the bass is going to sound. Pretty out there, right? At least this is how it sounds if I try it on the piano. Best explanation of this subject that I’ve seen. Now it makes sense, thanks! Superb stuff, as ever! The crystal clear explanations make it possible for us to , after a while, work some of these concepts into our own playing. Many, many thanks. You’re welcome, Tony, and thanks for the kind words! I’m confused. In the jazz blues chord chart above, in F how does the D7b9 get in there? The original blues chords would be F7 Bb7 and G7 wouldn’t they . Even though we are talking about b5 substitutions D7b9 isn’t a sub for any of those chords . what’s going on? Hi Phil, the D7 is the V of Gm7 in bar 9. It’s the VI7, and was popularized by Count Basie (https://www.jazzguitar.be/blog/jazz-blues-chord-progressions/#basie). Nowadays it’s a standard chord in a jazz blues, often preceded with an Am7b5 or Am7.